I was lucky, I’m of an age where I got to experience all three of the Back to the Future movies as they originally appeared in theaters. 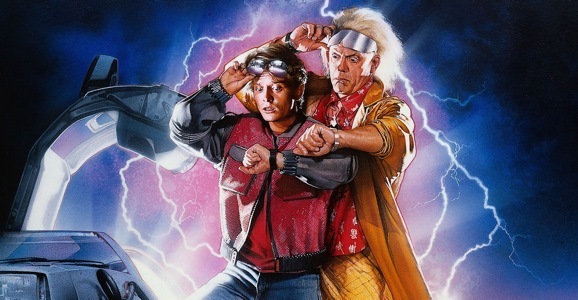 (I actually broke my hand playing baseball, but refused to be taken to the doctor until the next morning because I had already made plans to see Back to the Future Part III on opening night. It was totally worth it.) While you may have missed it back in 1985, never been able to catch it at a midnight screening, or simply haven’t seen it on the silver screen in some time, you now have a chance to rectify this situation. Cinemark Theaters has scheduled screening Robert Zemeckis’ time travel adventure for both Sunday, July 14, and again Wednesday, July 17. This is part of their “Cinemark Classics Series,” a summer long line up that also includes such fan favorites as Animal House, Ghostbusters, and George Lucas’ American Graffiti. More than 130 theaters in the chain, with locations all across the country, will show Michael J. Fox pilot his iconic DeLorean back in time. Click HERE for a complete list of participating theaters, times, and prices, and hope that there is one in your general vicinity. If not, it might be worth a road trip, or calling in sick. After all, where else to you get to see a white teen from the 1980s help create Chuck Berry’s signature rock and roll sound, and get hit on by his own mother all in the same movie? If that doesn’t sound like a good time, you and I have very different tastes in fun. For those sad and sorry few who have no idea what we’re talking about, Back to the Future tells the story of young Marty McFly (Michael J. Fox), a skateboard riding, guitar shredding slacker who befriends Doc Brown (Chirstopher Lloyd), a crazy old coot from his neighborhood. I’m not sure such a friendship would fly quite as well these days, but the 80s were a kinder, gentler time in cinema. It also turns out that Doc Brown has turned a DeLorean DMC-12—a stainless steel sports car—into a time machine, and after he sees his friend murdered in front of him, he takes off on a fun filled adventure through time. In subsequent chapters, Marty travels to, and influences various futures, as well as going way, way back, to the Wild West, where he and Doc Brown have an awesome cowboy escapade.